Current President and CEO of Néstor Reyes Inc. (U.S. Customs Brokers and Foreign Freight Forwarders) and President of ImEx Zone Logistics (FTZ Public Warehousing/Logistics), Edmundo Rodríguez has been in the Industry for over forty years as a Customs Broker, Foreign Freight Forwarder and Trade and Foreign Trade Zones Consultant. Having attained higher education in Business Administration, summed to more studies in International and National Trade, he has catapulted his career in such a way that he has acted as Expert Advisor offering "Pro Bono" consulting services to the Government of Puerto Rico in matters associated to Transportation, International Commercial Treaties and Free Trade Zones. In 1995, he became a member of the First External Trade Advisory Committee to the House of Representatives. He was honored by the Chamber of Commerce of Puerto Rico with the Zenit Award for Businessperson of the Year in 2002 for his outstanding achievements in the social and economic development in Puerto Rico. In 2008, the Puerto Rico Suppliers Development Council, Inc. named him Director and Certified Suppliers Representative to the Board of Directors. As a result of his excellent work and productiveness, in 2009, former Governor Luis Fortuño designated him as member of the Board of Foreign Trade (Junta de Comercio Exterior). 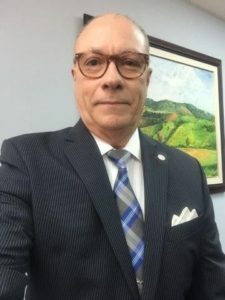 He was also elected President of the Committee of Transportation and Logistics of the Chamber of Commerce of Puerto Rico in 2013 (position he still holds as of 2016), and in 2015 he was appointed Vice President of the Transportation and Logistics Committee of the Puerto Rico Manufacturers Association (PRMA). On February 3rd 2015, current Governor Alejandro Garcia Padilla named Rodríguez as Member of the "New" Foreign Trade Board of Puerto Rico. In January 2016 Rodriguez was appointed Chair of the Puerto Rico District Export Council (term expires on December 31, 2017) by the Secretary of Commerce of the United States.